FCC Chairman Ajit Pai (previously) is planning to make good on his promise to kill net neutrality this weekend, under cover of the holidays, ushering in an era in which the largest telcoms corporations can extract bribes from the largest internet corporations to shut small, innovative and competitive internet services from connecting to you. Under this regime, a company like Fox News or Google could pay a bribe to a company like Comcast, and in exchange, Comcast would make sure that its subscribers would get slower connections to their rivals. This is billed as "free enterprise." Net Neutrality was won in America thanks to an improbable uprising of everyday people who finally figured out that this boring, wonky policy issue would directly affect their futures, and the way they work, learn, raise their children, stay in touch with their families, start businesses, participate in the public sphere, stay healthy and elect their leaders. Millions of Americans called, wrote, marched and donated and won over the largest, best-funded corporations in America, beating them and forcing the Obama-era FCC to protect the free, fair, open internet. Ironically, Trump owes his victory to the neutral internet, where insurgent racists and conspiracy theorists were able to gather and network in support of Trumpism without having to outbid mainstream political rivals. Across Trumpist forums, the brighter among his supporters are aghast that a Trump appointee is about to destroy the factors that made their communities possible. Ajit Pai is planning to introduce his anti-neutrality fast-track vote over the holiday weekend in the hopes that we'll be too busy eating or shopping to notice. Thanksgiving is when students go home for the holidays to fix their internet connections and clean the malware out of their computers. Those students -- awake to the Trumpist threat to their futures -- will spend this weekend explaining to their parents why they need to participate in the fight for a neutral net. 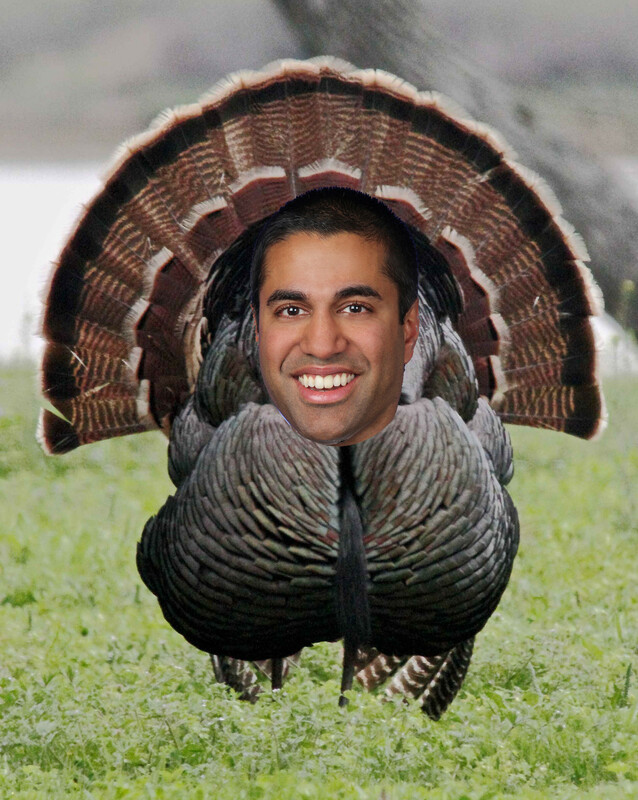 Thankgiving is when workers stay home from the office, participating in online forums and social media, where they will have raucous conversations about this existential threat -- because a free, fair and open internet isn't more important than climate change or gender discrimination or racism or inequality, but a free, fair and open internet is how we're going to win all those fights. Sneaking in major policy changes over the holiday weekend is a bad look. People are better at understanding procedural irregularities than they are at understanding substance. It's hard to understand what "net neutrality" means -- but it's easy to understand that Ajit Pai isn't killing it in secret because he wants to make sure you're pleasantly surprised on Monday. The "failure to observe regular order" is the hallmark of looters and crooks, and it foiled the GOP's attempt to murder Obamacare and is about to kill their tax plan. Pai's arrogance and incompetence are the epitome of the Randian delusion of supermanhood, the belief that no one can figure out what you're up to because you are such a job-creating, 11-dimensional-chess-playing Galt. Except this obfuscation plan isn't "devilishly brilliant," it's a massive underestimation of the brutal backlash awaiting the broadband industry and its myopic water carriers. Survey after survey (including those conducted by the cable industry itself) have found net neutrality has broad, bipartisan support. The plan is even unpopular among the traditional Trump trolls over at 4chan /pol/ that spent the last week drinking onion juice. It's a mammoth turd of a proposal, and outside of the color guard at the lead of the telecom industry's sockpuppet parade -- the majority of informed Americans know it. Net neutrality has been a fifteen year fight to protect the very health of the internet itself from predatory duopolists like Comcast. Killing it isn't something you can hide behind the green bean amandine, and it's not a small scandal you can bury via the late Friday news dump. This effort is, by absolutely any measure, little more than a grotesque hand out to one of the least competitive -- and most disliked -- industries in America. Trying to obfuscate this reality via the holidays doesn't change that. Neither does giving the plan an Orwellian name like "Restoring Internet Freedom." It's abundantly clear that if the FCC and supporters were truly proud of what they were doing, they wouldn't feel the need to try and hide it. If this was an FCC that actually wanted to have a candid, useful public conversation about rolling back net neutrality, it wouldn't be actively encouraging fraud and abuse of the agency's comment system. To date, the entire proceeding has been little more than a glorified, giant middle finger to the public at large, filled with scandal and misinformation. And the public at large -- across partisan aisles -- is very much aware of that fact.